Get creative with your daytime drinks. Compass Rose riffs on their signature sparkling pomegranate cocktail for bottomless brunch. Photo courtesy of Compass Rose. Bottomless bloodys is an oxymoron (can anyone really drink more than two?). Mimosas can get monotonous. Try one of these free-flowing brunch drink deals instead. Think pink on the lovely 45-seat patio of this Bloomingdale haunt (also heated for year-round imbibing). All-you-can-drink draft rosé goes for $27 per person with a two hour limit. Pair your vino with an Ivy City smoked fish and bagel board or warming shakshuka. These sister Mexican spots in Dupont and Navy Yard throw a hedonistic brunch (within a two hour limit) with bottomless chips, salsa, guacamole, house margs, and beers in addition to the usual brunch drinks. Patrons can also get one—and only one—gratis El Jimador shot in Dupont. As the menu says: “It’s a marathon, not a sprint—please drink responsibly” (responsibly-ish?). Dupont’s Spanish spot is also an all-you-can-eat-and-drink affair with unlimited tapas and red and white sangria (or mimosas) for $39 per person. The new Penn Quarter location has a slightly different menu but the same bottomless libations. Both the Capitol Hill and Clarendon locations of Ivan Iricanin’s atmospheric Balkan restaurants serve all-you-can-eat-and-drink menus ($34 to $44). In Clarendon, there’s more than mimosas and bloodys, including peach bellinis with tea-infused puree, a “brunch aperitivo” (fortified wine, orange juice, and Balkan bubbly), and minty red wine punch. Note the drinks in here are 25 cents, per Virginia law. Brunch at this oft-packed Dupont bar features bottomless Narragansett tallboys (as well as traditional bloodys and mimosas). The $25 deal includes an entree like a classic American breakfast or brunch burger. Bottomless old fashioneds would be dangerous, but you’ll certainly get your fill when you and at least three friends order a barrel of the whiskey cocktail ($60 per barrel). The kegged drink is a mix of Old Overholt, bitters, and simple syrup over ice. Make sure to order something to pad the stomach like chicken and waffles. We’re fans of the brunch menu at Rose Previte’s eclectic restaurant—essentially the regular menu of global small plates plus a handful of daytime specials. In addition to regular fresh fruit mimosas, you can get bottomless Prosecco or bubbles spiked with pomegranate liqueur. Restaurateur Richard Sandoval is known for all-you-can-eat-and-drink brunches at all his DC ventures (El Centro, Toro Toro). 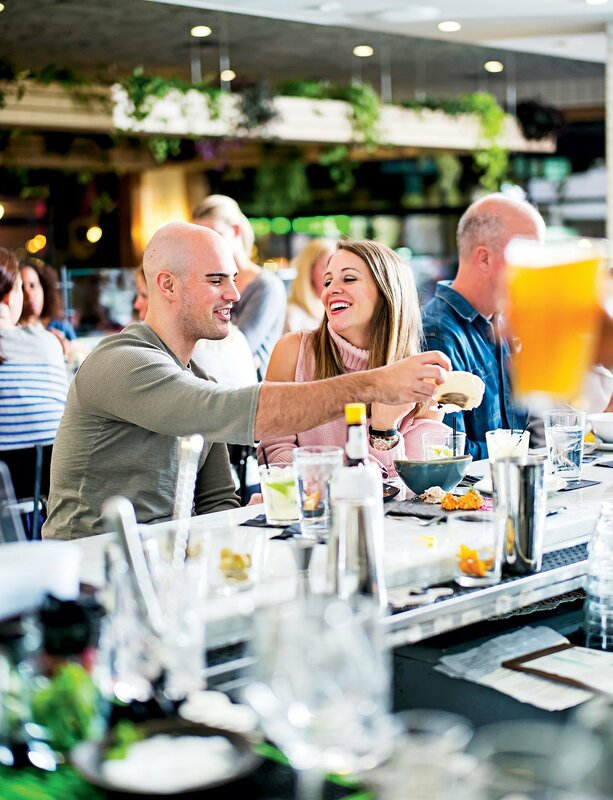 At this Latin/Asian spot, groups can camp out on the covered rooftop with lychee bellinis and lemon lagers in addition to bacon bloodys and mimosas ($39 per person including unlimited food). Didn’t get enough Bud Light the night before? 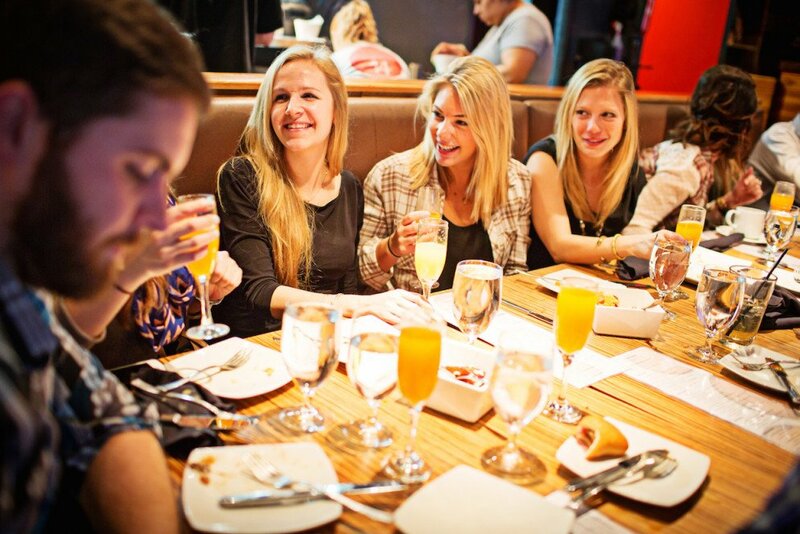 Everyone gets a second chance at this U Street bar, which pours all-you-can-drink BLs and orange crushes as well as mimosas and bloodys with an entree ($37.99 per person). A shot is also included, because that’s definitely a good idea.